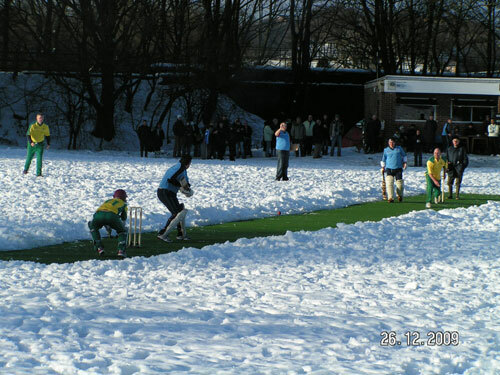 The annual Boxing Day cricket match has been a traditional event since the mid 1960s. The teams of Brooksbottom and Bolton Road got together every year, come rain or shine, snow or frost, fog or monsoon, to take part in a keenly-fought and entertaining contest. The teams battled for honour and to win the Brian Statham Trophy, initially sponsored by the former Lancashire and England fast bowler himself. In 2006, with Bolton Road (now Elton Vale) no longer able to fulfil the fixture, Tottington St Johns were approached to take their place, and we accepted with no little haste. For the first few years, each game was played at Brooksbottom CC, with the trophy exchanging hands every year up to 2011, when Totts were victorious. 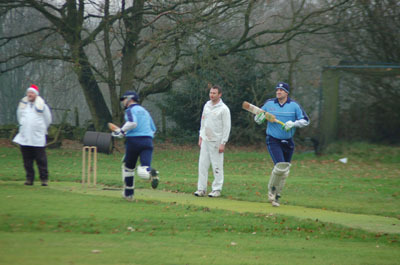 In 2009, Tottington hosted the game for the first time on the newly-installed artificial wicket. In recent times, media interest has also surged; in addition to coverage in the local press, the game has been mentioned on Test Match Special, Sky Sports, BBC Radio 5 Live, BBC NorthWest news and match action has even been shown on Sky Sports and the BBC! Boxing Day cricket returned to Crompton Meadows in 2015 - and with it the grand opening of our new extended pavilion and upper tier facilities! However, torrential rain washed out the game so we played on Good Friday 2016 instead, with Brox emerging victorious in a close match! In 2017, Brooksbottom hosted the game for the 2nd straight year as Crompton Meadows was undergoing significant work to level the ground and improve the playing surface. We urge any cricket lover, friend, family member or any lover of the absurd to come down and watch 22 players and 2 umpires partake in this most entertaining Boxing Day tradition - you are assured of a warm welcome, a decent pint and very friendly company.